I recently took a trip to California to visit my sister and her new baby. I’ve kind of been trying to ration E.F. Benson’s Lucia novels, because they’re such a joy in trying circumstances — the last time I read one was in terrible weather as I was producing food for seventy-five children — but they’re loaded on to my Kindle, and during this trip, I couldn’t resist reading two of them at one gulp. They were absolutely delicious, as I’ve come to expect. 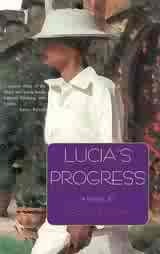 After Mapp and Lucia, Lucia’s Progress feels quieter by comparison. Yet the subtleties and intricacies of Tilling life — fads, elections, real estate, quarrels, marriage — wind around, and Benson shows the way people in a small, close-knit community deal with one-upmanship, ageing, snobbery, impulses to generosity, and mutual loathing. It’s a light-hearted book, and extremely funny, but insightful too. If you haven’t read these, you’re really in for a treat. Mapp & Lucia is my favorite in the series, I think, because we get Riesholme and its Elizabethan pagent, and then we get to watch Lucia meep Miss Mapp and the rest of Tilling. Even though I’d already met all the Tilling folk in Miss Mapp, I thought that book was quite as lively as the other books – no doubt it’s the lack of Lucia. I think that’s why I liked it best, too. In fact, I found myself wondering during Lucia’s Progress just what the Riseholme folk were doing with their empty lives! I adore the series – I read the first four, had a break of a few years, then went back to the beginning and read all six. Apparently Tom Holt’s sequels are very good too – they’re waiting for me. You bring out all the things I love about the series, and have me dying to read them again! I laughed reading this review. I haven’t read any but your review shows it would be fun. They really are such fun. It is such a small, social-climbing world, and so funny. These were some of the first books I borrowed from the library when I first got my adult ticket. I would love to read them again. You ought to! I can see that these will be well worth doing some comfort re-reading later in life. I’m pleased that I still have one to go, but as I said, I think these will definitely stand up to re-reading. I have used the Lucia books for the same comforting purpose. Have you seen the brilliant 1980s TV version? If not, you need to Netflix it. Wonderful stuff. Oh, Thomas, thank you! I have had that version suggested to me several times by Netflix, but as you no doubt know, their algorithm is not infallible, and I had hesitated. I will get it straightaway, maybe this weekend. I’m so pleased to hear it’s good. I love these books. I read them when I had pneumonia very badly – they were the best medicine I ever took! But at some point I should read them again to free them from the lingering associations of illness. They are just delightful. So you know what I mean about their being wonderful in trying circumstances! Poor thing, pneumonia is awful. And you can’t laugh! But these books would be perfect when you’re sick.